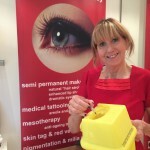 Gillian has been in the beauty industry for over 25 years and has specialised in Advanced Aesthetics for over 15 of those. She works closely with highly recommended Cosmetic and Reconstructive Plastic Surgeons, nurses, technicians and consultants and many salons and clinics in Kent and the South East as well as London Harley Street. While her main place of work is at her home clinic in Chiselhurst, she is often in the local area as she has close links to Options Beauty Salon in the High Street. 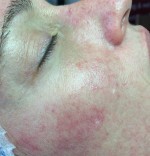 She recently held an evening event there in order to demonstrate the techniques she uses during her treatments. There are many different types of treatments Gillian performs – skins peels, scar relaxation, specialist waxing, thread vein/pigmentation/skin tag removals, Semi-Permanent make-up and medical tattooing and these treatments can really transform people’s lives and boost their confidence. So far Gillian has removed clear moles from my face and neck, millia from around my eyes, skin tags from my face, and given me beautiful semi-permanent eyeliner. It’s all well and good Gillian spending time making my skin look lovely but I’ve started to realise that perhaps I should be doing a little more to help myself too. 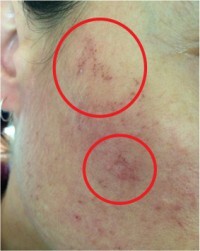 This time Gillian started with a tailored facial and skin consultation. 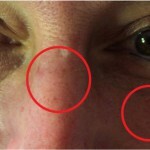 She was able to point out to me where I suffered dryness (did you know there is oil-dry skin and water-dry skin? ), upon examination of my ‘T zone’ area – the area that is generally oiler than the rest because more oil glands are located here – Gillian gave me some tips and tricks on what I can do to help myself to look after my skin better and what to use on it. She used one of her cleansers and demonstrated a lovely facial cleanse using her finger tips followed by removing the cleanser with two sponges soaked in warm water. My skin felt very radiant after the experience. Each facial is tailored to her client’s individual skin needs and she’ll never give you the same facial twice. Gillian also provides you with product samples and sponges to take home in a goody bag. As you would expect, Gillian does have her preferred range of products – Image Skincare – which as well as being really good, it also includes an organic range and is completely free of the chemical preservative ‘parabens’. As well as facials Gillian also performs skin peels which can help with many different conditions such as acne, rosacea, pigmentation and orange peel skin. 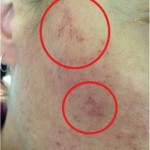 The products she uses encourage skin regeneration using the latest ‘stem cell’ technology. After my relaxing facial had finished, I waited patiently as Gillian prepared her electrolysis machine ready to attack my red veins or Telangiectasias, spider veins , as they are medically referred to. The main target areas for Gillian were my cheeks and nose! 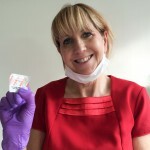 As with any treatment involving a ‘probe’, Gillian always shows her client the sealed packet the probe comes in so you know it is clean and sterile. I had been getting used to having numbing cream applied to my skin before the previous treatments I’d had with Gillian but she explained that for this particular one, red vein removal, it wasn’t possible. This did make me feel a little nervous realising I didn’t have the protection of the numbing cream to reduce any potential pain I might feel during the process. The actual process works by heat from the electrolysis probe evaporating the vein in the same way the sun evaporates puddles. Well, I needn’t have worried, it wasn’t too painful at all and felt more like little prickling sensations on my skin. The only sensitive area for me was around the side of my nose and the tip of my nose particularly made me flinch but it didn’t take too long for Gillian to complete her work and we were done. The final part of the treatment involved cooling down my face and this was done by applying cool cotton pads making my skin feel much relieved as it was tingling. We then went over the aftercare routine, Gillian deposited the used probe in her ‘sharps bin’ to be disposed of professionally, and I left with my goodie bag and also purchased cleanser and moisturiser as I was determined to start my new skin care routine (which I have been undertaking religiously nearly every day now). There wasn’t much to see immediately following the treatment other than redness but over the next few days I had little scabs forming in the areas that had been ‘zapped’. Gillian always makes sure that when I’m booking my appointments with her I don’t have any important engagements in the few days following as you do need to allow your skin to heal properly and for any swelling and redness to subside. Of course following the aftercare instructions is extremely important in ensuring that your skin will heal properly.